So why in the world would you need to make homemade dish soap when you get a bottle at just about any grocery store for less than a dollar (especially if you're buying the really cheap stuff!) Well, I guess if you were stocked up you wouldn't really need too, but this is really fun to make, SUPER easy, and still probably costs less than the cheapest dish soap you can buy. I don't make it often, but we're in the "counting pennies" stage of January and it's a snow day and I'm not willing to go out to the Dollar General just to buy dish soap because I'm out. That's a wasted trip of gas in my opinion! AND... hubs was so interested in what I was doing he stopped to come over to see how it worked. I told him it was science and he was in. Don't ask me about the actual science. I have no idea, I just know it cleans dishes when I'm out of Mrs. Meyers or Dawn and that's good enough to me. And I actually have all the ingredients on hand (because I've been known to make lots of other homemade household cleaning items) so it's a win win in our house. Washing soda is SLOWLY becoming easier to find (I get mine from a local ACE hardware store, but you can also buy it from amazon (because what CAN'T you get from amazon these days? ), and it's really key in this recipe. It's what gives the dish soap thickness over a day or so to make it act and feel like the dish soap you're used to buying from the grocery store. Make sure not to confuse washing soda with regular baking soda, while I've used baking soda in homemade clothing detergent in it's place, it's not the same product and it does NOT work in this recipe! 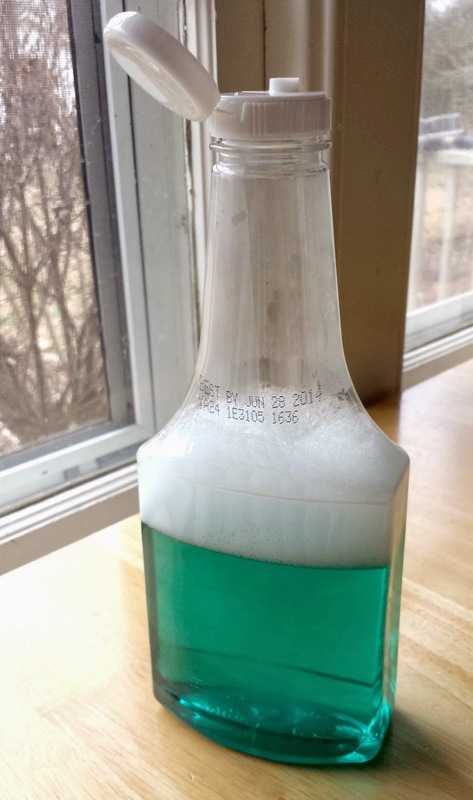 It took less than five minutes to "cook up" this bottle of dish soap. And it's enough for at least two weeks. We made the soap different colors just by adding a drop or two of food coloring, but you can simply leave it natural and it's a light lemon yellow color. Somehow my husband seems convinced it works better if it looks like Dawn! lol... So buy some castile bar soap, some washing powder (the stuff will not go bad, it's good forever!) and next time you run out of dish soap try making your own! I use Dr. Bronner's castile soaps. I generally keep several bar soaps on hand along with a large container or two of the peppermint liquid castile soap and the lavendar liquid castile soap. Those scents are just personal preferences and you could use any scent for dish soap. Castile soaps are crazy useful and super inexpensive (considering they are very concentrated) and will clean just about anything. I've used them for washing everything from clothes, to floors, to bathrooms, to windows, to using them in the shower when I was out of our regular shower scrub! It's a very versatile and frugal item to have on hand. I would say this soap works just as well as any type of non-concentrated Mrs. Meyers or Dawn or Joy dish soap. 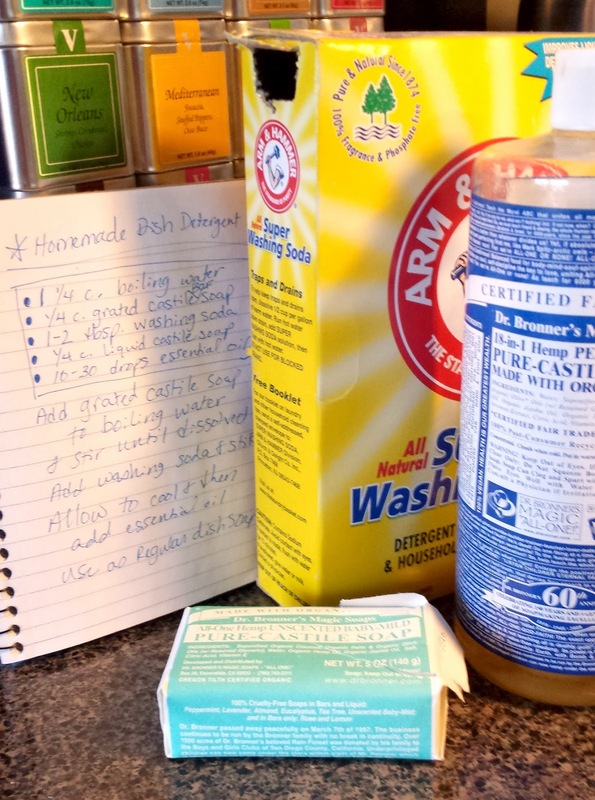 You can play with this recipe and add additional washing soda and grated castile bar soap to the small amount of water for a more concentrated soap. Beware though, that the more soap is added, the thicker the soap will become as it sits or ages. To thin it down, simply add a bit of warm water and close the lid and shake to thin it down. Add grated castile soap to the boiling water. I do this right in my small stainless steel pot that I heated the water in. Add the washing soda and liquid castile soap and stir to combine into a slowly thickening liquid. Pour cooled soap into a recycled plastic bottle or even a glass jar dispenser. We've been using a ketchup bottle we washed out and re-used. who knew? I'm intrigued. I've actually never heard of castile soap. where I can buy the ingredients to make soap?